"Sampath Speaking" - the thoughts of an Insurer from Thiruvallikkeni: Pro-kabaddi league 2016 : Patna Pirates will meet Jaipur Pink Panthers in finals. Pro-kabaddi league 2016 : Patna Pirates will meet Jaipur Pink Panthers in finals. Dharmaraj Cheralathan, Rajesh Mondal, Bajirao Hodage, Pardeep Narwal, Fazel Atrachali, Abolfazel Maghsodlo .. .. .. and more, - we have been hearing these names and seeing them in action for more than a month now ! – no prizes for guessing, it is the line-up of Patna Pirates in Pro-kabbadi 2016. Remember that in oct 2014, at Incheon, defending Champions India staged a late comeback to edge Iran 27-25 in the men's kabaddi final to retain their gold medal at the 17th Asian Games. The Iranian team rode on their athleticism, speed and agility to give a scare to the much-vaunted Indian team, who were complacent for the most part of the match. The Indians utilised their experience and kept calm to give the country its 11th yellow metal in the Incheon Asiad, moving up to sixth place in the standings. Five-time world champions India, with a starting line-up of Rakesh Kumar, Jasvir Singh, Anup Kumar, Manjeet Chhillar, Navneet Gautam, Gurpreet Singh and Ajay Thakur, appeared to have taken things lightly ~ playing for Patna now - Fazel Atrachali, Abolfazel Maghsodlo – were part of Iran in that match. Patna Pirates is owned by KVS Energy and Sports Limited, their opponents in Semi-finals today was Puneri Paltan, owned by Insurekot Sports Pvt. Ltd., Puneri Paltan is one of two Pro Kabaddi franchises from Maharashtra. The team represents the city of Pune. 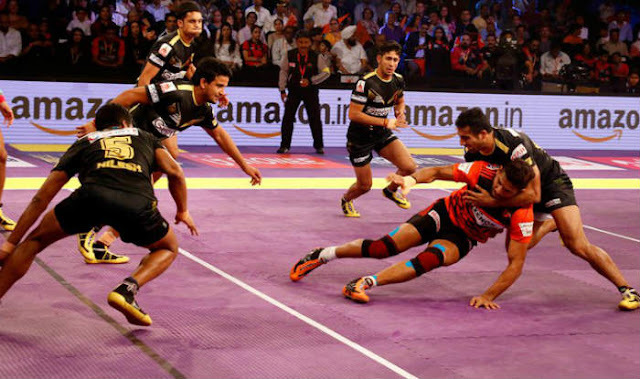 For those not following the popular game – the Pro-Kabaddi League is a professional kabaddi league founded in 2014. It is formulated as an eight-city league played in a "caravan format," traveling together to all 8 venues to play a total of 60 Matches. The 2016 Pro Kabaddi League season is the fourth season of Pro Kabaddi League. At Gachibowli stadium in Hyderabad, defending champions Patna Pirates took on Puneri Paltan in the first semifinal match. Patna who finished first in the points table ended their season 4 with 10 wins from 14 matches. On the other side, with six wins from 14 games, Pune was the last team to qualify for the play-offs after edging out Bengaluru Bulls. In season 4, led by Manjeet Chhillar- Pune found it difficult to beat Patna in both their meetings. In the first encounter Pardeep Narwal & Co. stood ahead after defeating Pune by six points while in the second leg, Pune ended on the loosing side by three points. Much was spoken on whether Manjeet Chhillar’s men can make it into their first ever Pro Kabaddi final beating Patna .. and with 10 minutes to go, it did appear that they would indeed make it. Pune were 25 – 22 and then came the thrust. Pirates rode on a brilliant performance by Pardeep Narwal to make it to the semi-finals of the Pro Kabaddi League as they beat Puneri Paltan 31-28; making it the fourth consecutive season in which Patna made it to the last four. In the 30th minute Patna Pirates inflicted their third all-out as they led 28-16. Puneri Paltan mounted a strong comeback as they cut the lead to just four points with four minutes go. Narwal scored his 12th raid point in the 37th minute as Patna led 30-25. Puneri Paltan scored two raid points in the last 90 seconds but it wasn't enough as they lost 28-31 in the end. In the other Semis, Telugu Titans who could record a 46-25 win over Patna Pirates who were not playing their full team faced Jasvir led Jaipur Pink Panthers and at the time of posting appears to be losing for sure. 29th July 2016 @ 10.10 pm.